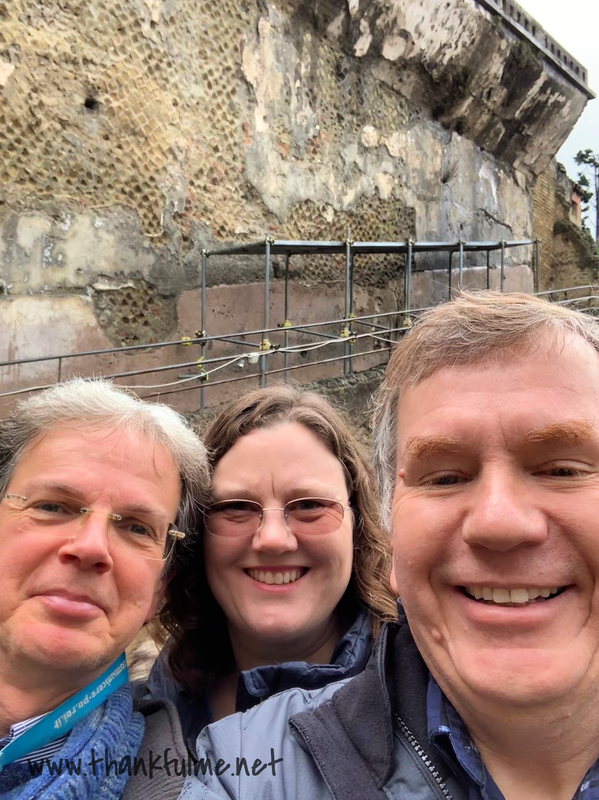 One of the days we stayed in Naples, John and I decided to get brave and use some of our free time to take the train to the nearby town of Ercolano to view the ancient ruins of Herculaneum. 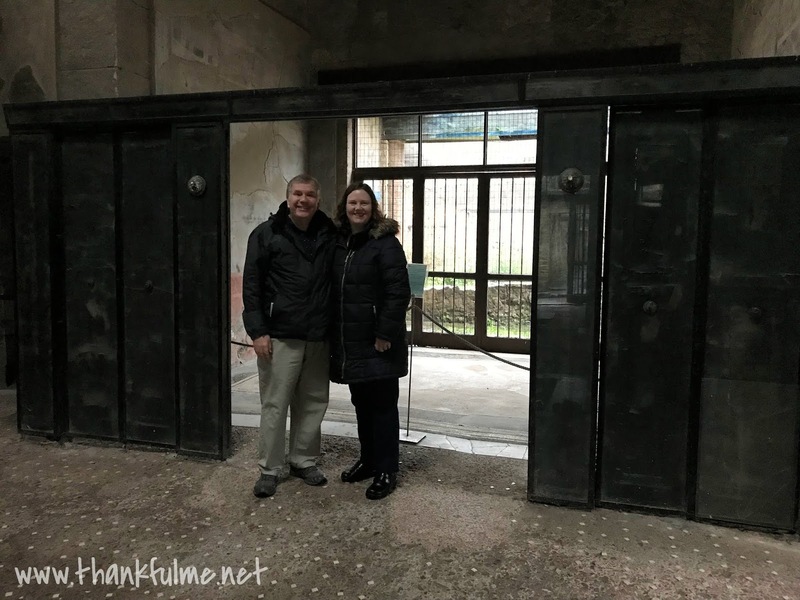 We caught the early train, so we could arrive at opening "to avoid the crowds." The rain did a good job of keeping the (albeit, off-season) crowds at bay, but our early arrival on an inclement morning did assure that we toured an almost-empty city. You may not have heard about Herculaneum; everyone seems to know about Pompeii, but Herculaneum also fell victim to Mt. Vesuvius in 79 A.D. 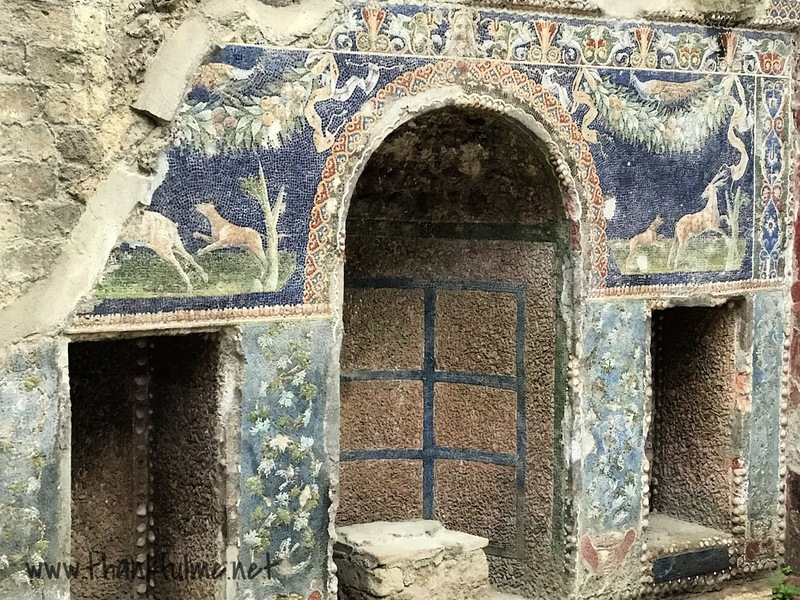 According to our tour guide, Herculaneum was a more upscale town. 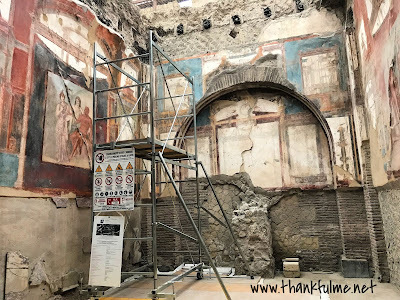 At the very least, it utilized a sewer system that went under the streets, as opposed to the above-ground, free-flowing waste that traveled the streets of Pompeii. 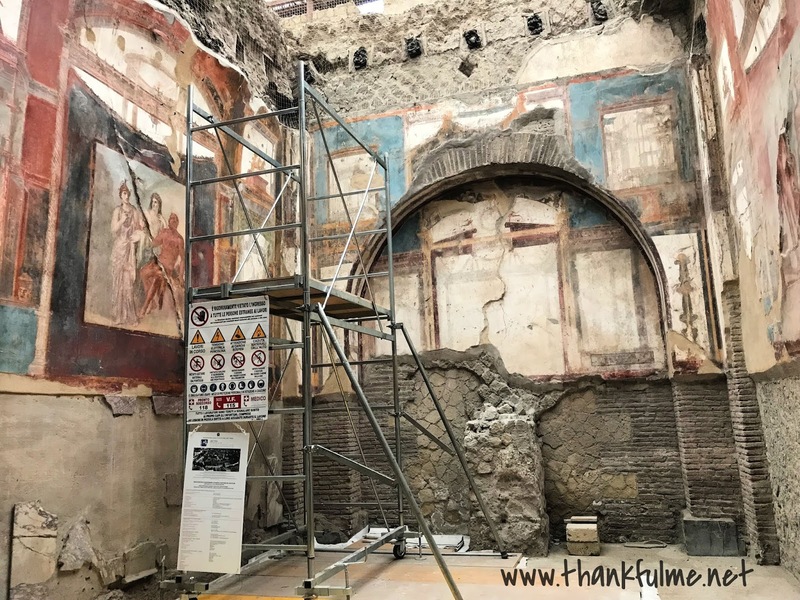 Another major difference between the two cities is that Pompeii was covered with ash from the eruption of Mt. Vesuvius, but Herculaneum was buried in mud. Because of the mud, air could not reach the ruins, so wood that normally would have decomposed is still preserved. The eruption occurred in 79 A.D., and it amazes me to think that anything wooden could still be around from that long ago! The mud also helped preserve the vibrant colors of the art on the walls of the homes and shops. 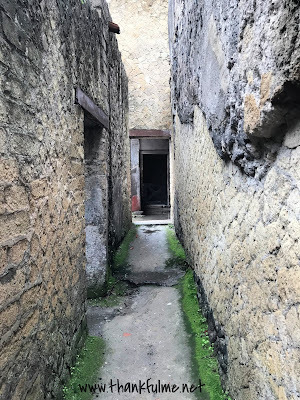 Before Herculaneum was covered in mud, it sat right at the edge of the sea. (The mud extended the shore out quite a bit.) When Mt. Vesuvius first erupted, some of the residents of Herculaneum fled to the boat houses to await rescue. Unfortunately, rescue did not come. An intense blast of heat from another eruption instantly killed the waiting people. Today, around 300 skeletons can be seen at Herculaneum. According to our guide, DNA analysis has proved the familial relationships of some of the remains. It is a somber thought to reflect on the circumstances of the death of so many people. Seeing the skeletons, and hearing the information our tour guide, Luciano Leone, told us, really helped bring Herculaneum to life. If you ever visit, I would recommend hiring a tour guide. I learned so much more than I would have if I had just explored on my own. Our tour went to Pompeii instead, and i always wished i could have seen both. There are always more places to explore, aren't there?